From the New York Times best-selling author of The Drunken Botanist comes an enthralling novel based on the forgotten true story of one of the nation’s first female crime fighters. Constance Kopp doesn’t quite fit the mold. She towers over most men, has no interest in marriage or domestic affairs, and has been isolated from the world since a family secret sent her and her sisters from city to country fifteen years ago. When a powerful, ruthless factory owner runs down their buggy, a dispute over damages turns into a war of bricks, bullets, and threats as he unleashes his gang on their farm. The sheriff enlists her help, and it turns out Constance has knack for outwitting (and disarming) the criminal element that might just take her back out into the world and onto a new path in life. 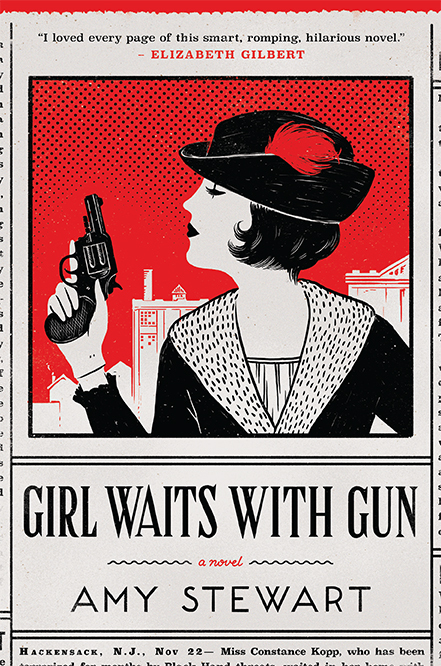 Quick-witted and full of madcap escapades, Girl Waits with Gun is a story about one woman rallying the courage to stand up for and grow into herself — with a little help from sisters and sheriffs along the way. Through Amy Stewart’s exuberant storytelling, Constance Kopp catapults from forgotten historical anecdote to unforgettable historical fiction heroine — an outsized woman not only ahead of her time but sometimes, even, ahead of ours. Amy Stewart is the award-winning author of six books, including the bestsellers The Drunken Botanist and Wicked Plants. She and her husband live in Eureka, California, where they own a bookstore called Eureka Books. 1. From horse-drawn wagons to carrier pigeons, the norms of 1914 obviously no longer exist today. Talk about the world Constance and her sisters live in, in New Jersey and on their farm. Are there any aspects of life in 1914 you wish had survived? 2. After Henry Kaufman’s first visit to their farm, Constance views her sisters from afar and thinks, “They looked like those fuzzy figures in a picture postcard, frozen in place, staring out from some world that no longer existed” (p. 52). What is the world that no longer exists? Why is it gone, and what has replaced it? 3. What is it about Lucy Blake’s story that haunts Constance so? Why do you think she helps her when interfering with Henry Kaufman has already brought a threat to her family? 4. It’s clear that Constance is a unique woman for her time. But Sheriff Heath is also unusual in that he takes the Kopp sisters seriously when no one else would. Why do you think he helps them? What would you have done in their shoes? 5. At their Wyckoff farm, both Norma and Constance were encouraged to continue their mother’s “family tradition” of fear and distrust. In what ways did the sisters fall in line, and in what ways did they fail to heed her warnings? Do you think they felt justified in ignoring her warnings? 6. On page 384, Fleurette suggests that their year of harassment at the hands of Henry Kaufman was also the most interesting year of their lives, and therefore might not have been such a bad thing in the end. What if it were you—would you agree with Fleurette? 7. The author created a signature cocktail for the book called the New Jersey Automobile based on an actual 1910s-era cocktail called the Automobile. What would Norma think about an alcoholic beverage being named after their run-in with Henry Kaufman? 8. There’s a lot of talk these days about characters’ likability. Would you call the Kopp sisters likable? Do you think they even liked each other? Did you suspect the family secret? When did you figure it out?